We’re looking at this gorgeous tomatoes and chickpea salad and we’re all thinking the same. What’s that carrot doing in there? Well my sister made this light, refreshing and satisfying salad for lunch last week and may I say: it was amazing. Perfect on its own as a lunch, also as a side and you can have it as dinner as well. It’s vegan, gluten-free and loaded with antioxidants. As with most recipes at Beauty Bites you can make this salad in almost no time. I know we all don’t like to cook for hours when we’re hungry and busy. This is just another way to use my all-time favorite combination of chickpeas, basil and tomatoes. Add some sesame seeds and lots of onions and you’ll be happy for the rest of the week. Let’s get back to the carrot story. We had a whole bag of carrots and we needed to use them asap or let them die moldy in a few days. And thus one of them was chopped brutally and made it into the salad. There – mystery of the carrot solved. If you don’t like the carrot in the salad – just leave it out. There – mystery of the carrot solved. If you don’t like the carrot in the salad – just leave it out. But be warned that carrots besides being good for your eyes and making your vision super clear also whiten your teeth when you chew them. And as if that wasn’t enough – because they contain lots of beta-carotene they give your skin a nice orange glow (you’d need to you eat a ton of them to develop a completely safe condition called carotenemia for that). Isn’t that the dream of the whole Jersey Shore cast? I mean they make everything so pretty. And they taste awesome, although I needed some time to get used to them. It’s like with cilantro – at first I didn’t really like it, but once I started eating it, I’m mesmerized by its smell and want to put it in everything I make. And they taste awesome, although I needed some time to get used to them. It’s like with cilantro – at first I didn’t really like it, but once I started eating it, I’m mesmerized by its smell and want to put it in everything I make. was on flat bread. Warm delicious flat bread. Mmmm. Stop it. I had no idea what those tiny black things were. I thought it was dirt or just burnt sesame seeds that tasted weird. Turns out they’re nigella seeds aka black cumin. I did not like cumin as well. People change, I’m telling you. And just like cumin nigella seeds do have some extra health benefits. A lot of them. I think it can even compete with my friend garlic in that. Nigella is considered to be anti-inflammatory, anti-bacterial, anti-fungal, antioxidant, protect against cancer and heart disease…but it’s not a health food competition. If you’re interested in anti-inflammatory foods that will make you feel great and look beautiful, I’ve written a post about 5 other awesome anti-inflammatory foods that you can check out here. Let’s take a look at the health and beauty benefits of this lovely salad. As you can imagine this salad is not just great for your taste buds, it’s also super healthy because it’s bursting with carotenoids (thank you red pepper, tomatoes, and carrot! ), vitamin C (all veggies), E (sesame oil, sesame seeds), detoxifying phytochemicals from onions, and thanks to sesame seeds – lots of calcium. We need all these are nutrients during summer, because they protect us from the free radicals caused by higher sun exposure. These free radicals cause wrinkles & skin cancer, make us age with the speed of light and cause various health issues (to say the least) like cancer and cardiovascular diseases. This salad will boost your immune system, prevent inflammation and alkalize your body. Ok, now that you’re done and super motivated to eat tomatoes, let’s make the recipe! Chop pepper, cilantro, onions, tomatoes, carrots. Add to chickpeas in the salad bowl. Add sesame oil (olive oil works as well) and balsamic vinegar. Mix everything and add salt if needed. Garnish with basil, sesame seeds, nigella seeds. Mediterranean chickpea stew – made in just 15 minutes, vegan and gluten-free and super easy. My anti-inflammatory chickpea lettuce wraps, that again are made in about 15 minutes and are full of antioxidants. 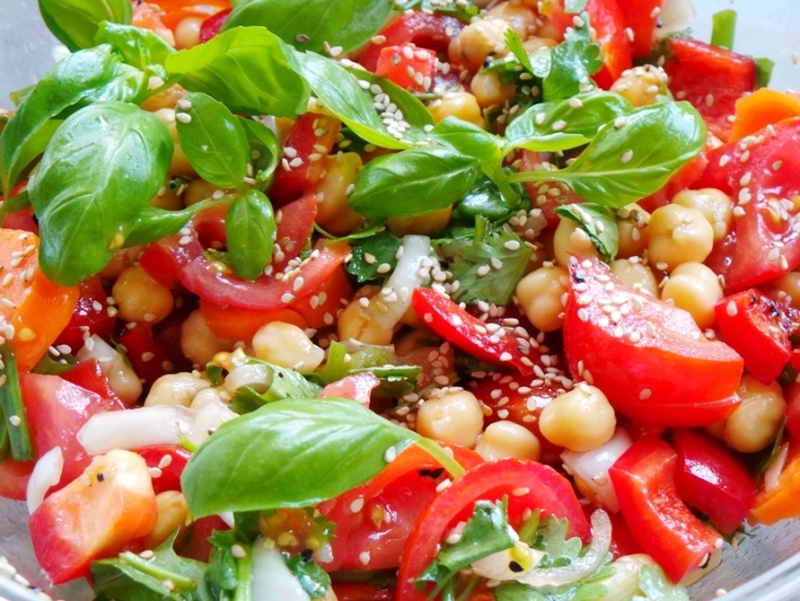 Or this simple, delicious tomato, chickpea and baby spinach salad that is also good for your skin. Looks wonderful! What a beautiful, healthy and delicious salad! As I said – I wasn’t a big fan of the carrot in there, but you can add whatever you have to this salad. It’s super easy and I’ve already tried it with some avocado, rocket, spinach, cucumbers, or even more basil – all these work perfectly. Hope you like it! So many vegan recipes to choose from. Healthy, delicious and looks very appetizing! Can’t wait to try all of them! Cheers!! Can I make this a day before l need it.? Want to bring it to work for a farewell party. I wouldn’t pre-make the whole salad a day before, because most of the ingredients are fresh and taste better when they’re fresh. I have tried a few salads with tomatoes that were a day old and they were horrible even though they were originally very delicious. Rinse and drain chickpeas and place in an airtight container. Then wash and chop all vegetables and herbs. Store vegetables and herbs separately, in airtight containers in the fridge (should be fine, although onion might smell, so if you have time – chop in the morning). Measure out the seeds. Wash tomatoes. It’s very important to make sure the vegetables and herbs you washed are packed in the fridge without water – otherwise could spoil. In the morning cut the tomatoes and combine everything, add salt, olive oil and vinegar (not the evening before), mix. Have fun at the farewell party! I made this last week and, good lord, it is delicious! Definitely a keeper. Thanks Rhonda, glad you enjoyed the salad! how many servings does this make approx.? ?